New yoga music. Yes, I listen to some pretty different stuff when I do yoga…it’s not all “namaste” and meditation for me, I do it to stretch and strengthen and relax after a long day at work, so I like music that makes me feel powerful. Immersion is a pretty good album for that. If there ever comes a day when a new Blake Crouch novel is announced and I don’t immediately start fangirling, check my pulse, because I’m probably dead. To understand why, you have to flash back a year or so to when I first got a copy of Abandon from NetGalley. I sat down to read it thinking I had it totally pegged, and the deeper I got into the book, the more I realized just how wrong I was. Every time I thought I had a good handle on what the hell was happening and what might happen next, Crouch threw something at me so shocking that I could barely turn the next pages fast enough. When I first saw the cover for Dark Matter pop up on NetGalley, I requested a copy without really reading the description. I mean, it’s Blake Crouch. From reading through his previous books, I can see a clear pattern: the man just gets better with each new book. Rumor has it the movie rights to Dark Matter were optioned before he even completed the manuscript, so I’m clearly not the only person with this mindset. If I had to guess at how he comes up with new story ideas, I would say he clicks around on the Internet until he finds a topic that interests him, and then proceeds to research the hell out of it until he can write the most compulsive book about it that exists. Whatever he’s doing, it’s working pretty damn good. Now, the thing about Dark Matter is that it’s one of those books where the less you know, the better off you are. I rolled my eyes at a lot of very hype-y reviews that said the same thing about Gone Girl and once I read that book, I realized that the reviewers were not lying. So when Goodreads was flooded with warnings essentially saying the same thing about this book, I took heed. You should too. I will give you the most spoiler-free review that I can, and I will warn you that it’s a good idea to make sure you have no pressing commitments that will interrupt the reading of this book, because it’s damn near impossible to put down. Get your snacks ready and snuggle in! What follows is such a crazy ride that I’m not even sure I can compare it to many other sci-fi or spec-fic novels. I have no idea what the below GIF is pulled from, but it’s a pretty good summary of my feels about this book. From reading books across the spectrum of his career, I would say that Crouch has definitely matured as a writer. He isn’t afraid to cut characters loose or to show you things that are deeply uncomfortable, even if they don’t offer the happiest of endings for the characters involved. This is actually a pretty dark book once you start to think about it. A lot of themes come into play here: choice, second chances, and the long-reaching consequences of seemingly small choices. It definitely makes you think about all the events that have shaped who you are today, and how those little “what ifs” that linger at the back of everyone’s minds are actually not so little. I’ve also heard this book described as a love story, and after a pause, I would agree. You can’t really ever make a choice about your own life without affecting the lives of the people you love. If you trade your dream for a life with someone else, is that trade worth it? If you had a second chance to do it all over again or take a different path, what would you do? It definitely makes your mind wander. So in short: go read this book. Buy it, so you can read it multiple times. I promise you’ll be blown away. 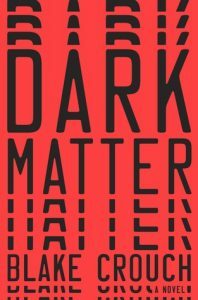 Dark Matter, by Blake Crouch (hardcover, 352 pages). Published July 2016 by Crown. Genres: science fiction, speculative fiction, thriller, mystery, suspense, fantasy. Five out of five stars. Find it on Goodreads, Amazon, BN.com, or the Book Depository. Don’t forget to friend me on Goodreads while you’re there—I love making new bookish friends!